Provincial Councils and Local Government Minister Faiszer Musthapha yesterday said that the no-confidence motion against Prime Minister Ranil Wickremesinghe would have no negative impact on President Maithripala Sirisena. Responding to Galle District MP and Home Affairs Minister Vajira Abeywardena outburst on Wednesday, Minister Musthapha said that the statement clearly showed that Minister Abeywardena had no legal knowledge or had not understood the provisions of the Constitution. Minister Abeywardena, on Wednesday, warned President Maithripala Sirisena and the SLFP that the no-confidence motion moved against the UNP leader and Prime Minister Ranil Wickremesinghe would boomerang on them. Highlighting Article 42(4) of the Constitution (which states, ‘The President shall appoint as Prime Minister the Member of Parliament, who, in the President’s opinion, is most likely to command the confidence of Parliament) Minister Musthapha said that the President was not affected by a no-confidence motion moved against the PM. 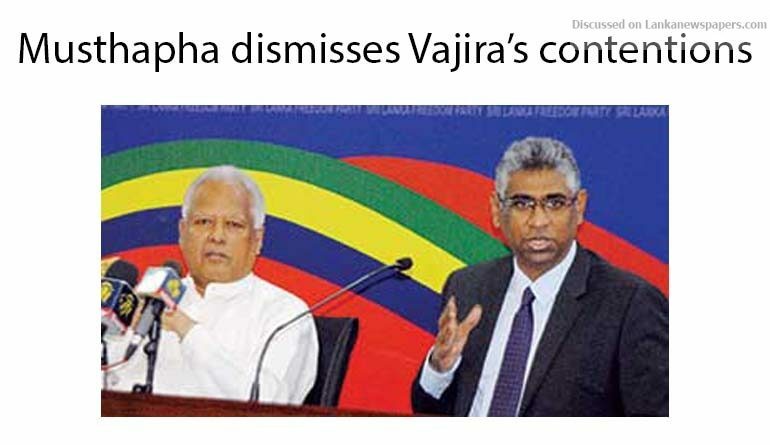 He stressed that President Sirisena was selected as the common candidate in 2015 by the UNP as that party had no trust in their leader and if their leader had been able to face a presidential election, UNP would never have agreed to field Sirisena as the common candidate. The situation was the same at the last general election, and the unity government emerged as none of the main parties had been able to secure a clear majority in Parliament. If any one of them had the majority. “This is the truth which everyone should know,” he added. Asked whether SLFP would support the no-confidence motion against the PM, he said the SLFP would take a collective decision at its Central Committee meeting to be held soon.